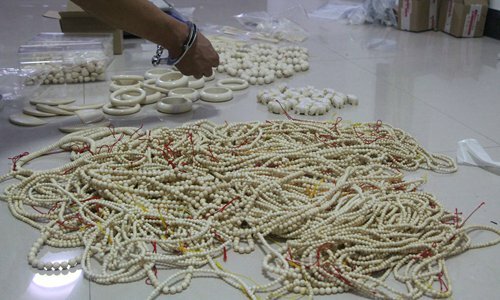 More than 5,300 pieces of ivory and ivory byproducts, which weigh 306.8 kilograms, have been seized by China's customs this year and China will continue to cooperate with other countries to cut the smuggling of endangered species, a senior Chinese customs official said on Monday. China's customs departments have seized 103.4 tons of smuggled endangered species and their products since the beginning of this year, Hu Wei, vice minister of the General Administration of Customs of China, said at a Monday briefing in Beijing. On March 30, customs officers and police from Hefei in East China's Anhui Province, Nanjing in East China's Jiangsu Province, Qingdao in East China's Shandong Province and Beijing seized 2,748 ivory tusks weighting a total of 7.48 tons. China reported a quarter of the total of cases involving smuggling of endangered species during a campaign jointly held by the World Customs Organization and International Criminal Police Organization from February to March, Sun Zhijie, director of the administration's anti-smuggling bureau, told the Global Times at the conference. China has cooperated with more than 60 countries and regions in the crackdown on smuggling of endangered species. "I believe the next step is to enhance international cooperation in fighting against ivory smuggling, such as establishing stricter protection and tracking mechanisms for ivory tusks from Africa," Huo Jianguo, vice chairman of the China Society for World Trade Organization Studies, told the Global Times on Monday. In cooperation with China, enforcement agencies in countries and regions such as Malaysia, Vietnam and Singapore seized 2.247 tons of ivory, 29.42 tons of pangolin scales and 90.5 kilograms of rhinoceros horns. Chinese customs also held training classes to prevent smuggling of endangered species in certain Asian and African countries. China banned the trade of ivory and ivory products at the end of 2017. However, international opinion is not fair on the country. China has devoted itself to battling ivory smuggling and has signed up to many pacts on endangered species. But there is always smuggling and it takes more time and efforts to deal with it, Huo said. According to a report sent to the Global Times previously, wildlife conservation organizations WWF and TRAFFIC said they found that some ivory was smuggled directly into China from Africa, and some transited through Vietnam to South China's Guangxi Zhuang Autonomous Region. Sun said that China will continue to actively cooperate with law enforcement departments in other countries to cut smuggling of endangered species such as tusks and their byproducts.